The sound of running water has a calming effect on our minds and bodies – it’s no wonder that so many people opt for water fixtures and sounds in their homes. Flowing water can provide numerous health benefits for spiritual and mental wellness. Many psychological studies have suggested that the sound of running water can have a positive impact on our minds. Water sounds are naturally soothing and many people have used running water in meditation practices for years. Researchers believe that the sound of water can guide the neuronal waves in our brain, allowing for a calming effect. In addition, the sound of water is also a form of “white noise” which can provide multiple psychological benefits as well. In addition to its therapeutic benefits, a running water fixture can provide additional services to your home. The fixture can work as an elegant and unique décor piece both inside and outside the home. The sound of running water blocks out outside noises, which has therapeutic benefits but can also increase productivity in the home or workplace. Running water also provides natural humidity indoors, preventing dried-out skin, hair, and nails. Do you need a flowing water fixture in your home? 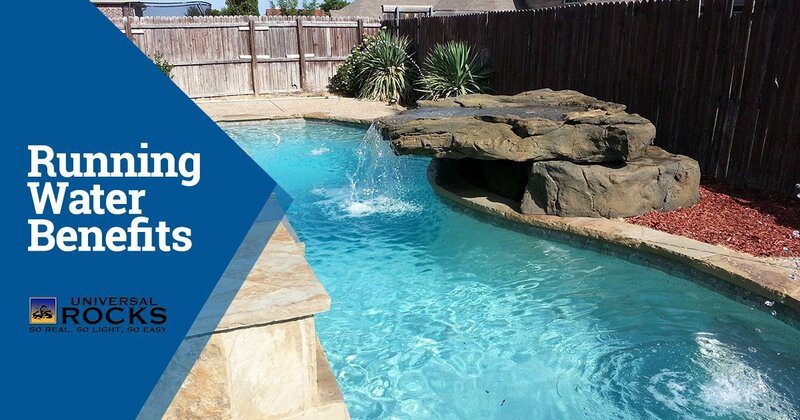 Contact Universal Rocks today to learn more about our premier waterfalls, pool kits, and more.